Good News: It’s Truck Month- and time to clear out the 2014 models to make way for the 2015s. That means great Truck Month offers on Chevy trucks all month long at Mirak Chevrolet, your Boston Area Chevy truck source. The 2014 Chevrolet Silverado’s safety systems incorporate new technologies designed to protect Boston area drivers and passengers through all three phases of vehicle safety: before, during and after a collision. Two available active safety technologies – forward collision alert and lane departure warning – are new to Silverado and are segment firsts. They use a forward-mounted camera to identify and warn drivers when they’re at risk of colliding with another vehicle or leaving their lane. Also, the all-new convex driver’s side spotter mirror assists drivers to help avoid crashes. New applications of advanced, high-strength and ultra-high-strength steel, along with new safety belt lap pretensioners, help provide additional occupant protection in case a crash does occur. Silverado’s numerous safety evaluations included extensive computer simulations with math modeling and physical crash testing using a family of crash test dummies GM helped develop. 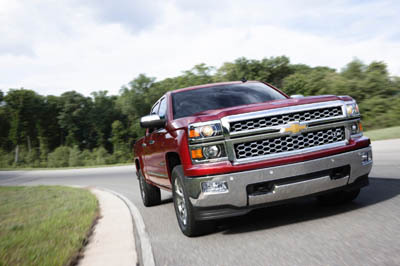 The 2014 Silverado’s full complement of vehicle safety technologies are designed to help Boston area drivers keep control of the truck and prevent collisions. • Step one: A green telltale light illuminates in the instrument cluster to let the driver know the system is on and tracking the vehicle ahead. • Step two: An amber light cautions the driver that the driver may be following much too closely, or tailgating. • Step three: Flashing red lights reflect up in the windshield along with warning beeps that a collision may be imminent. Technologies introduced on the previous generation Silverado, including GM’s StabiliTrak electronic stability control with rollover mitigation technology, trailer sway control and hill-start assist, are on this latest generation as well. Further confidence comes from an available rear vision camera and front and rear park assist. 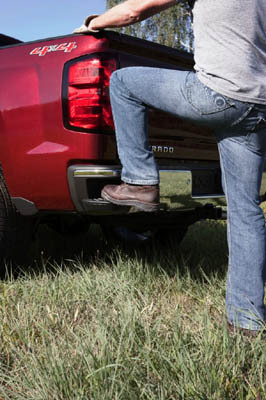 Standard on all light-duty Silverado models, StabiliTrak is always on, providing full stability, traction and ABS control whenever the vehicle operates in forward gears. The system intervenes with brake pressure, engine torque and, on 4WD Autotrac models, adjusts front to rear drive torque distribution to when it senses one or more of the wheels slipping or when the vehicle is not following the direction being steered. All New 2014 Chevy Silverado coming to Boston Area Chevrolet Dealers this Fall. Everything from Silverado’s interior and exterior styling to ergonomics and performance have been re-engineered. The new Silverado is stronger, smarter and more capable than ever. 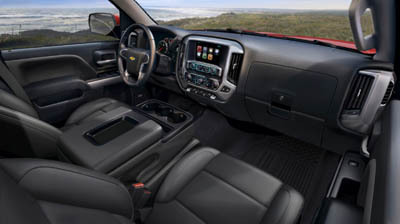 Silverado’s all-new interior is developed entirely around functionality. Centered around the needs of the driver, we intelligently integrated the smartest technologies into the interior, and the redesigned front seats are built for all-day comfort. Forward-opening doors provide easy access to a reimagined interior that provides more rear-seat leg room in Crew Cab and Double Cab models. Innovations in capability extend all the way from the hood to the hitch. Electric power steering, coil-over-shock front suspension and new high lateral-rate body mounts provide better ride and handling. Improvements like the fully boxed front frame and larger axles allow Silverado to tow even greater loads. Available integrated under-rail LED lamps, a new upper cargo tie-down system and an available innovative CornerStep rear bumper show we know how you use a truck. Click here to learn more about how Silverado helps you accomplish the task at hand, time and time again.